In March of this year, the governors of both Iowa and Utah signed into law statutes that criminalize various aspects of undercover investigations of farms. Both laws penalize obtaining employment on a farm under false pretenses; in addition, the Utah law also makes it a misdemeanor to take photographs or make recordings on farms without permission from the owner. These laws are just two in a wave of “ag-gag” bills introduced in several states, including Minnesota, Missouri, Nebraska, New York, and Tennessee. Ag-gag bills were also introduced in Florida and Illinois, where they were defeated. Already faced with significant obstacles to regulating the agriculture industry, which contributes significantly to environmental degradation, environmentalists are concerned about clearing yet another hurdle while working to promote more environmentally sustainable farms. Critics of ag-gag bills include animal protection groups, such the Humane Society of the United States, whose undercover investigations have led to animal abuse charges and food recalls, as well as prosecutors’ organizations like the Association of Prosecuting Attorneys (APA) and the National District Attorneys Association (NDAA). These groups point out that ag-gag bills make the agricultural industry, which already lacks sufficient public visibility and regulation, even more opaque. They deprive the public of information and divest concerned citizens and public interest groups of an effective enforcement tool that has acted as a catalyst for new federal regulation of the agricultural industry. Some of the proposed bills also contain overly broad language, criminalizing not only the undercover investigation itself but also the possession of the photos or videos taken on the farm without explicit permission. Besides raising red flags for those concerned with protecting animals, ag-gag bills should also pique the interest of those concerned with protecting the environment. Although these bills typically include exceptions for law enforcement officials and inspectors, farms already enjoy wide exemptions from environmental regulations and statutes despite their extensive effects on the environment, ranging from water and air pollution to habitat degradation. 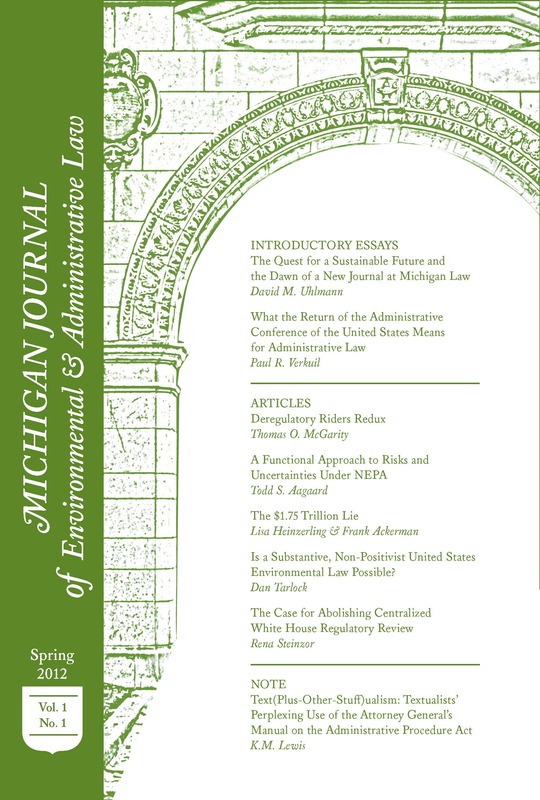 See J.B. Ruhl, Farms, Their Environmental Harms, and Environmental Law, 27 Ecology L.Q. 263, 263 (2000). Because there is no unified federal statute that expressly regulates the environmental impacts of farms, and most states have also chosen not to regulate these environmental harms as well,any regulation that takes place must be pieced together through other statutes, such as the Clean Water Act (CWA) and Clean Air Act (CAA).Id. at 293.But these statutes contain many express and implied exemptions for farms. For example, the CWA’s wastewater permit program for point sources was amended to exclude “return flows from irrigated agriculture,” Clean Water Act of 1977, Pub. L. No. 95-217, § 33(b), 91 Stat. 1566, 1577 (1977) (codified at 33 U.S.C. § 1362(14) (1994)), and the CAA contains de minimus discharge exceptions typically applied to farms that allow them to escape regulation. Ruhl, supra, at 305. In an industry already only minimally constrained by regulation from negatively impacting the environment, ag-gag laws could make it even more difficult to enforce what little law exists. Such laws could severely hinder the collection of evidence of environmental regulation violations, especially by dissuading those with valuable information from coming forward to the government or public interest groups for fear of harsh punishments.Furthermore, similar protection from public scrutiny and whistle-blowers could spread to other industries with extensive environmental impacts whose lobbyists effectively manage to curry favor with legislators. —-Caitlin Zittkowski is a Contributing Editor for MJEAL. She can be reached at czittkow@umich.edu. Next A Potential Supreme Court Case in the Making: How Safe of a Harbor is the EPA’s Silvicultural Rule?